Have you noticed that retailers have started to put out fancy Halloween costumes and information earlier and earlier to remind you that it is on its way. And after all of the costumes, decorations, and treats it is getting super expensive! When I was a kid my mom would make a costume or decorations for next to nothing. Now kids are being measured for their custom made outfits! There seems to be more and more parties and events to go to. 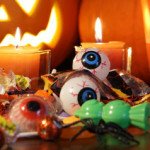 Halloween is getting more popular than Christmas and almost more expensive. I’m going back to the days of making my own costumes and having cheap and cheerful parties that are super fun. Here are some savvy strategies to take the “Boo” out of Halloween spending! 2. It’s already in your closet. Find old outfits in your closet or just add a “Hello My Name Is” sticker. Old short shorts and a basket ball tee makes for a cheap and dirty costume. You can be a slutty anything on the cheap, swimmer, pirate, cat, fire fighter, alien, Richard Nixon! You’ll be getting LOTS of treats this year. 2. Costumes on sale for the kids. Halloween costume prices get lower getting closer to Oct 31st so if you need a store made outfit wait as long as you can. Otherwise you can probably make it yourself. And stay away from masks. They are more expensive than makeup and you can’t see out of them AND get really hot. Leave them at the store and face paint your way to saving some money. 3.Buy a ton of insects or little monster toys and give them away instead of candies this year. Have you seen the cost of name brand candies now? It’s crazy. Give out little beasties to your visitors and save a ton on teeth and money. 4. Decorations are best to get at the dollar store. You can get everything there for a “boo”. Bat caves are super cheap and scary for the money. Black construction paper on the walls and a hand full of plastic bats and webs and you are good to go. 5. Pumpkins are cheaper from a farm or local market so make the drive out and support a local farmer. Load up on pumpkins for you and your friends and then split the cost. What is nicer and more relaxing than driving out to see the nice Fall colours and visiting a local farm. You can stock up on autumn apples too! Hope you liked all of my ideas from keeping the scary bills out of your Halloween fun.